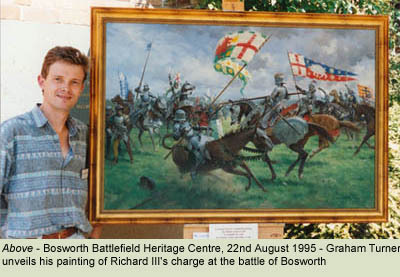 King Richard III's charge at the battle of Bosworth first inspired me nearly twenty years ago and the result, my first medieval painting, was unveiled at the battlefield back in 1995 (right). That painting changed the direction of my career, and while I have always been very happy with the way it turned out, I have long felt it was time for me to revisit the subject and create something new, a painting that would reflect the way my thoughts and opinions had evolved over the intervening time. I wanted the new painting to be a far more intimate and reflective portrayal of Richard, and I first sketched out my ideas early in 2012. Commissions and other projects then got in the way but I had just started to put paint on canvas when the stunning news broke that human remains had been discovered in Leicester - and they might well be those of the king himself. Like many around the world I was stunned; I was familiar with the story that he had ended up unceremoniously dumped in the river Soar, so the idea that this was even remotely possible came completely out of the blue. Of course I stopped work on the painting immediately - if this was indeed Richard, then the discovery was going to have a profound affect on my painting, and I obviously wanted to be able to incorporate any new information into my depiction. 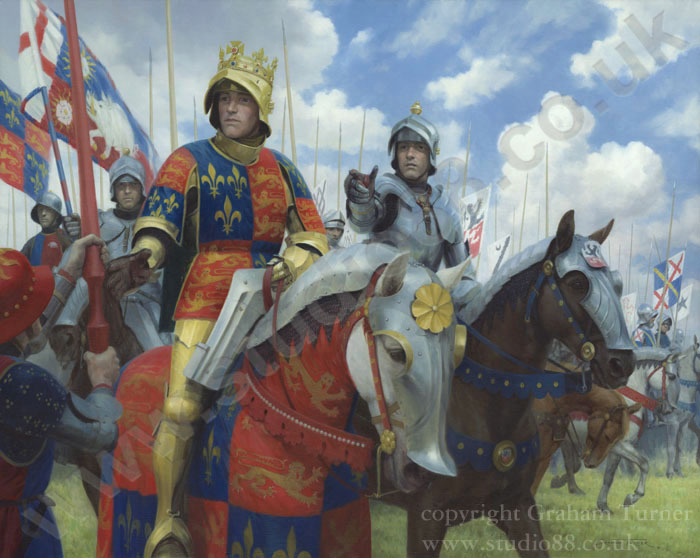 Like everyone I had to be very patient - it was quite a while until the DNA results were due to be announced and my painting waited on the easel - then on the 4th February came the amazing news, the confirmation that this was King Richard III. I was honoured to be asked to speak at the press conference at the Society of Antiquaries the following day when the facial reconstruction was revealed, so I was one of the first to see the likeness of Richard III in over five centuries. I'll never forget that moment, what an occasion - and my first thought was how familiar he looked. The chin, jawline, nose - he looked so like the portraits we know so well. I'll admit to being rather relieved: if he had looked very different then all my previous paintings of him would instantly become obsolete! The fact that the reconstruction had been created without any hint of who the skull might belong to, and the result fitted so well with the portraits, also added further to the proof that this was indeed Richard, but now we could see him in three dimensions. As I picked up my brushes once again I found myself reflecting on the amazing coincidence of timing that had seen me working on this painting at such a momentous time. There was still a lot to do, but I now felt a connection like never before with what I was creating. As more facts and opinions about Richard's remains emerged, and his scoliosis was discussed, I was able to feel a real empathy towards him, what he had overcome in his life, and how he might have felt at the moment I had chosen to depict. The decision to depict Richard in gilded armour was reached after much research and consideration. Fifteenth century kings are often depicted in manuscript illuminations wearing gilded armour, and fully gilded armour from the early 16th century survives, so after long discussions with Dr Tobias Capwell (Curator of Arms and Armour at the Wallace Collection in London and renowned expert on the armour of this period, who has researched and spoken on the armour of Richard III) I concluded that it was quite possible that Richard III might also have done so. Here was the king of England facing a challenge to his throne, at a time when visual display played a crucial role in demonstrating an individual's importance - it was imperative that he display his right to wear the crown of England in the most spectacular way. Some sources, such as the Burgundian 'Caesar' tapestries, depict gilded armour also heavily decorated with pearls and precious stones, so it might be that I've actually underplayed it! I have shown the crown on his salet decorated with precious stones, set in white enamelled roses modelled on those on the surviving crown of Margaret of York, Richard's sister. Richard's armour would have been bespoke, made to fit him perfectly, and as such would have allowed for the affects of his scoliosis. Plate armour is very supportive, and clever tailoring could have disguised the outward appearance of his condition quite effectively. In my depiction I have shortened his torso slightly and made the right side of the cuirass roomier, but with the surcoat covering much of his body these slightly different proportions are all but unnoticeable. Having amour myself and ridden and jousted in it over several years has provided me with considerable insight into what you can and can't do in it, helping me understand what I paint immeasurably, but how Richard scholiosis affected him, especially when wearing armour, I confess I can only try to imagine. It certainly wouldn't have made it any easier for him, and my respect for what he had to deal with has only gone up since this aspect of his physique was revealed. 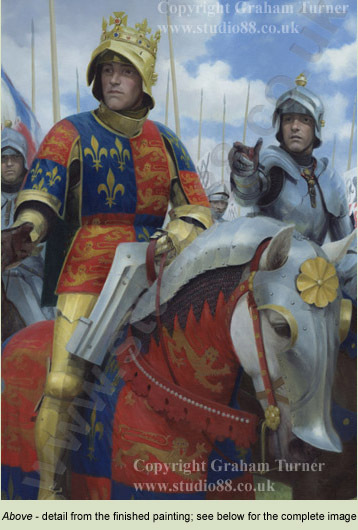 When choosing who else to depict in the painting I listed Richard's knights of the body and those we can be fairly sure rode with him in the final charge. Sir Robert Percy served with Richard in Scotland in 1482, was knighted in 1483 and was the Controller of his household, so I felt he was appropriate as the figure who has spotted Henry Tudor and is pointing him out to Richard. 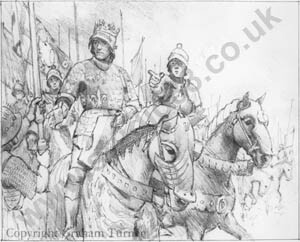 To the left and behind the king is Sir Percival Thirlwall, who in the Ballad of Bosworth Field is famously described as holding onto Richard's standard until the last, even after his legs were hewn from under him. Lord Scrope of Bolton is also shown and other banners indicate Sir Robert Brackenbury, Sir James Harrington, Sir Richard Ratcliffe and Sir Ralph Ashton. 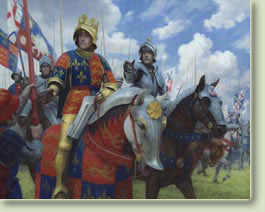 Other details are taken from surviving artefacts (the saddle is based on one preserved at Arundel castle for example) or sources such as the contemporary Beauchamp Pageant. My studio became covered with so much reference material, and the weeks since the painting was finished have been so busy, that I'm only just managing to file it all away again and start thinking about the next project! 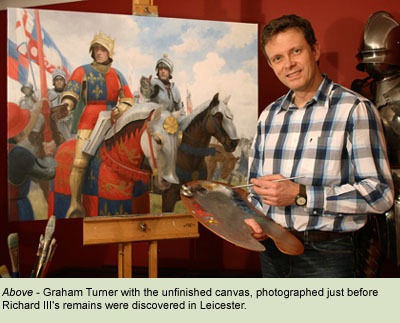 After what became a very long and totally consuming creative process, the painting was finally finished and unveiled at a most appropriate location, Bosworth Battlefield Heritage Centre, on the 29th June 2013. For more information about Graham Turner, CLICK HERE.